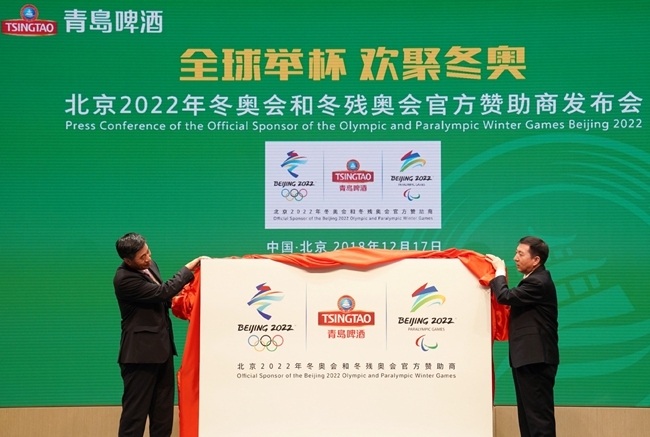 Leading Chinese beer producer Tsingtao Brewery has been named an official sponsor of the Beijing 2022 Olympic and Paralympic Winter Games. The 115-year-old company is one of the first official sponsors for Beijing 2022. The games began seeking tier-two sponsors in August 2018. It will be the company's second Olympic deal following its sponsorship of the Beijing Olympic Games in 2008. Beijing 2022 secretary-general Han Zirong praised Tsingtao for "taking a further step" in partnering with the Olympics, having contributed to the success of Beijing 2008. "We hope Tsingtao will provide Beijing 2022 with even better products and services. We hope to turn Beijing 2022 into an important opportunity for its growth," Han said. Tsingtao is headquartered in the coastal city of Qingdao, where the sailing events of Beijing 2008 took place. "To serve the Olympics again is a testimony to Tsingtao's strength as a company with more than a century of brewing history," said Huang Kexing, chairman of Tsingtao Brewery. "Tsingtao is happy to be joining hands with Beijing 2022 to leave the world with great Olympic memories once again," Huang said.